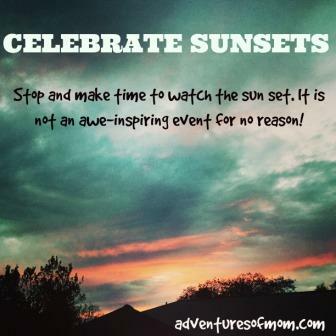 Sunsets are not glorious and awe-inspiring for no reason! We buried my mom’s ashes yesterday. It was a sad day, and quiet. Too quiet. Afterwards I spent the remainder of the day with my children, and they were too quiet too. No bickering. No electronic noise- I had made them leave all that at home. Even in driving, I didn’t even turn on the radio. And when we finally got back home, we all parted into our own spaces and I felt sad. So I grabbed some music and hit the treadmill. The dog plopped down in front of it and I walked and just kept walking, then I saw a light and looked up in time to see a blazing fireball peeking out from behind the trees in the distance. It was sunset, and it held promise of a beautiful one. So I unplugged. The treadmill. The music. And with the dog at my heels, I headed off with a lighter heart and a lighter step in search of a better view of the greatest show on earth: sunset. People gather around the world to hang out on beaches, by lakes and even on rooftops to watch the spectacular sunsets. Mallory Square in Key West, Florida swarms with tourists at sunset, travelers hang on the steps by the lake in Pushkar, India to mark the end of each day. On the Greek island of Santorini, people come from all over the world to the tiny cliffside village of Oia to watch the sun sink into the sea. It’s a celebration, of beauty and of life. I spent many a sunset on a rooftop, staring in awe as the sky changed colors over the Ropa Valley of Corfu. Sunsets are not glorious for no reason. They were meant to be celebrated. Meant to be watched. This momentous moment of each day is a gift- a free gift. Take advantage of this gift. Make watching the sunset a daily habit, like brushing your teeth, meditating, watching Dancing with the Stars or Housewives of Whatever City. Set your alarm and head outside- be it a rooftop, street, or the great outdoors (and bring your kids along too!) Make it a family event. Bring chairs or a blanket to sit on, or just stand. Invite the neighbors to join the event. Or go mobile and take a sunset hike. Or even just watch from the comfort of your own window or any window. (I’ve been known to just step outside if we are not home to catch the moment.) I’ve even pulled the car over as well, despite my kids groaning- they will do it themselves one day, or just have eccentric-mom stories to tell their children! Whatever methods you use and wherever in the world you may be, just enjoy the show! Check out some of my sunset photos on Instagram here.